I mentioned last time that I’d be back soon to baking something with chocolate, considering the string of chocolate-less recipes I’d been trying, and I promise that is still the plan. The first recipe for February does however involve a slight detour on that plan and another fruit-filled recipe. 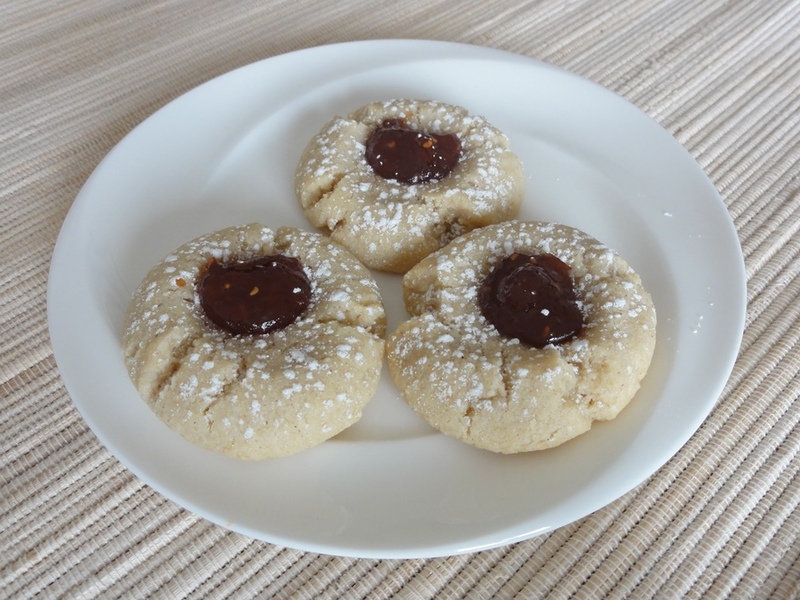 Many thanks to Ketty and Kristy over at Keepin’ it Kind for this recipe. 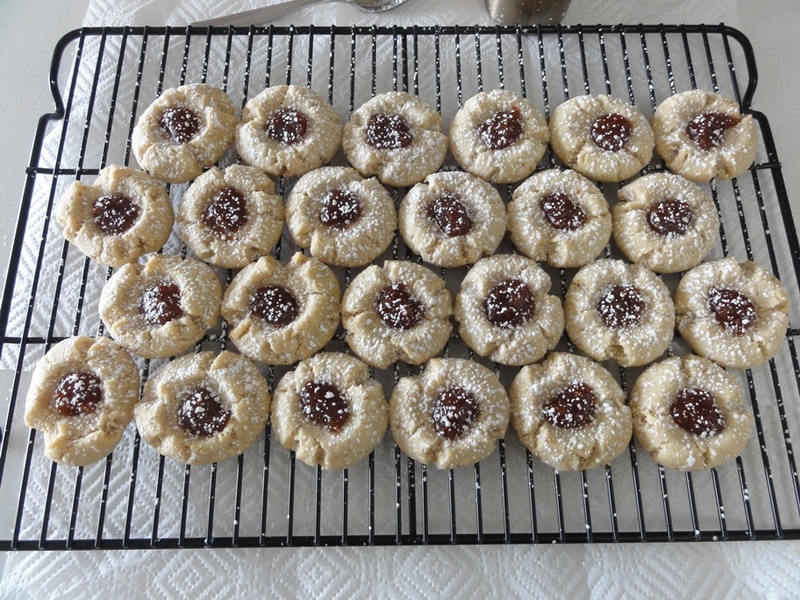 I’ve had “jam-filled thumbprint cookies” on my to-bake list for a while and this recipe served nicely to check that item off. 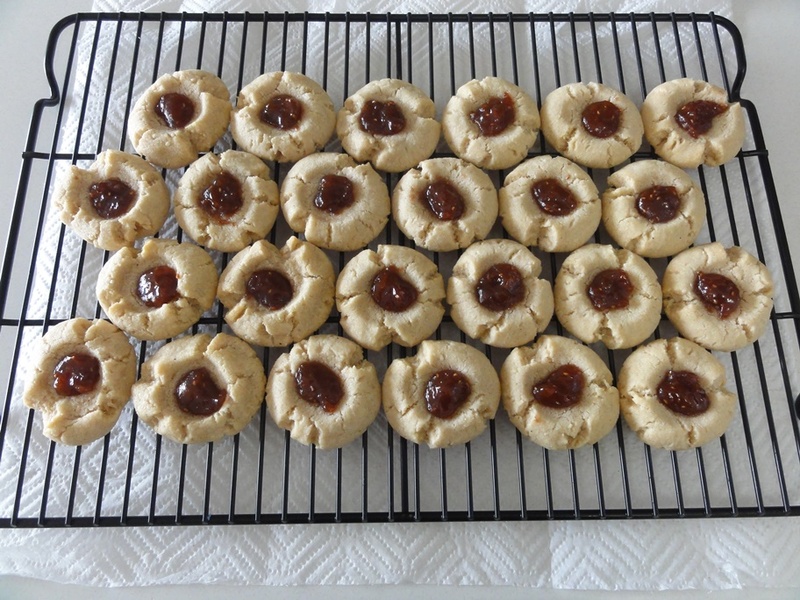 The cookies did not turn out quite like Ketty’s, which indented nicely and wrapped around the little sea of jam beautifully, whereas mine spread out and the indentation formed more of a crater leaving the dollop of jam sitting on its own. This is most likely be due to the gluten-free flour; I used my usual rule-of-thumb conversion of 1 cup wheat flour = 4.5 oz gluten free flour, but spreading is sometimes due to not enough flour and so this will take a little bit of experimentation to get the same aesthetic appeal as the original. That all being said the taste and texture of these cookies are amazing, setting aesthetics aside. The almond flavor is distinct and strong, the jam is just the right amount to not be overpowering, and the consistency is chewy while being a little crispy. These are great cookies, and even better? They’re vegan! These are now stacked up right alongside the Orange Spice Cookies for times when I want to bring a vegan option to the table. You wouldn’t know that they’re lacking the traditional butter and eggs if no one told you and that speaks very highly of the talent behind the original recipe! Cream together the coconut oil, sugar, vanilla extract, and almond extract on medium speed until well combined; about 2-3 minutes. 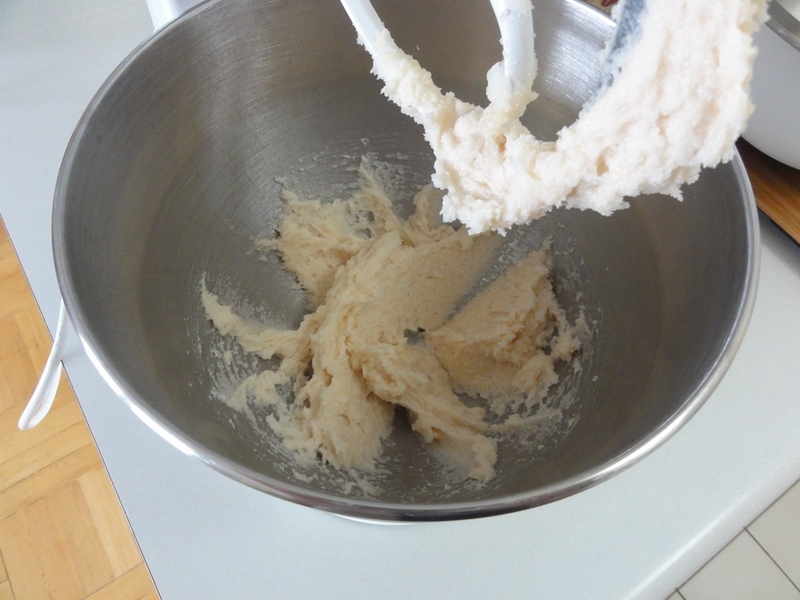 In a medium bowl whisk together the flour, baking soda, and almond meal. 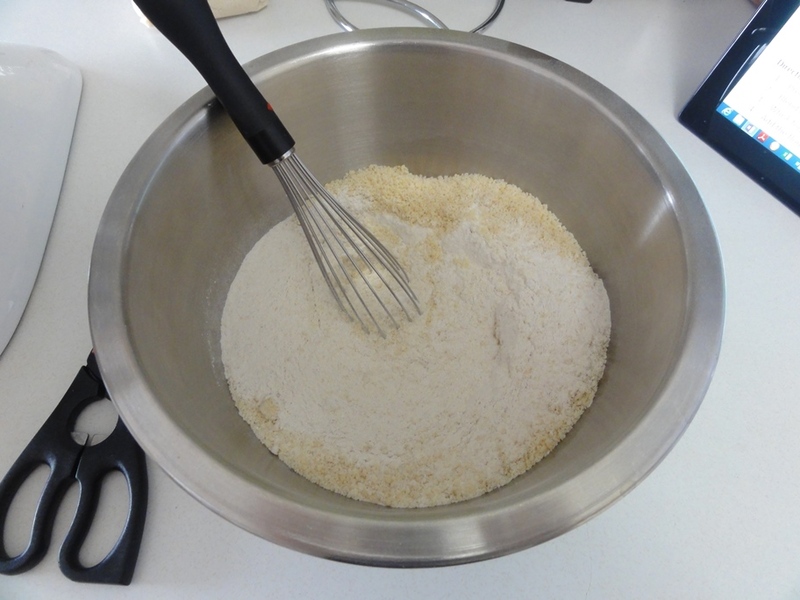 Add about half of the flour to the wet ingredients, a 1/4 cup at a time, mixing until well-combined. Add the almond milk and mix until well-combined. Add the rest of the flour, a 1/4 cup at a time, mixing until well-combined. 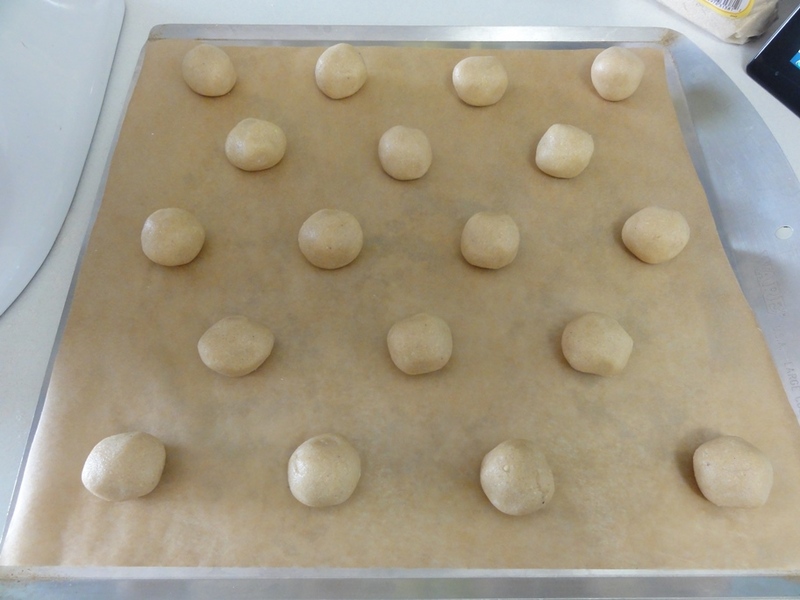 Roll level tablespoonfuls of dough into balls, place them on lined cookie sheets, and make an indentation in each cookie. 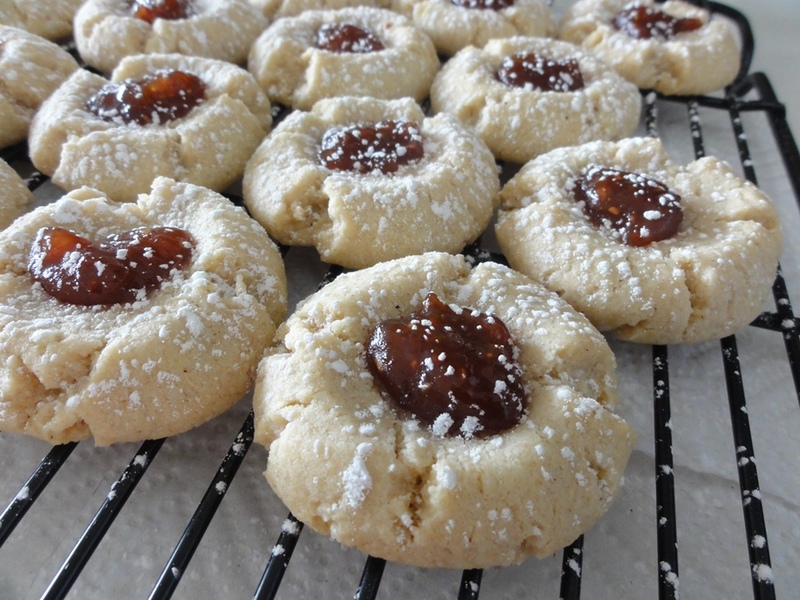 Remove the cookies from the oven and add 1/4 tsp of jam to each cookie; you may need to deepen the indentations first. Bake for another 6 minutes, until the edges are starting to turn golden brown. 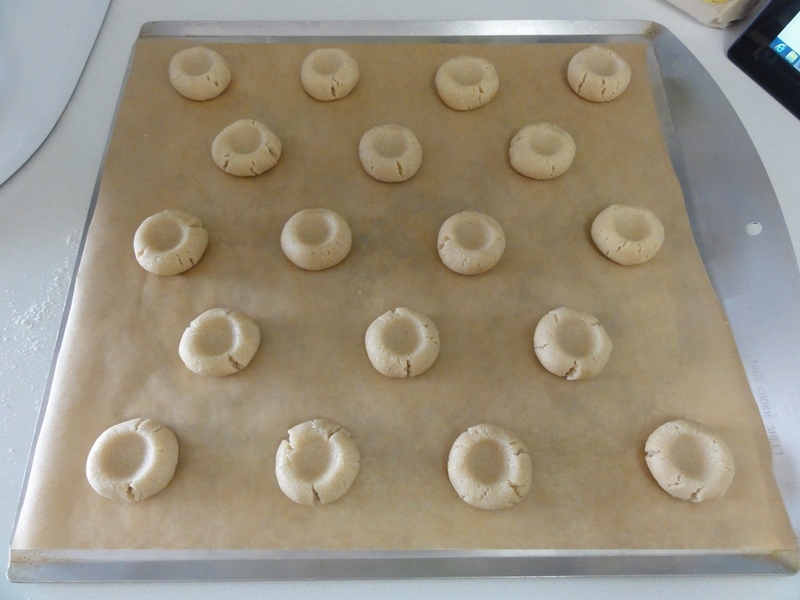 Let the cookies cool for 5-6 minutes on the trays and then transfer to wire racks to cool completely. Dust the cookies with powdered sugar to your preferred degree of dusting. It would be worth trying to make these cookies with unrefined cane sugar to include the no-processed-sugar aspect of food-consciousness. The base cookie is chewy enough that I don’t think you’d notice a rougher sugar in the texture. You’d have to lose the powdered sugar topping, but I think using a large-grained sugar (raw Turbinado sugar, for example) would give it great presentation just as well, and to be careful about what jam you use (or just make your own!). 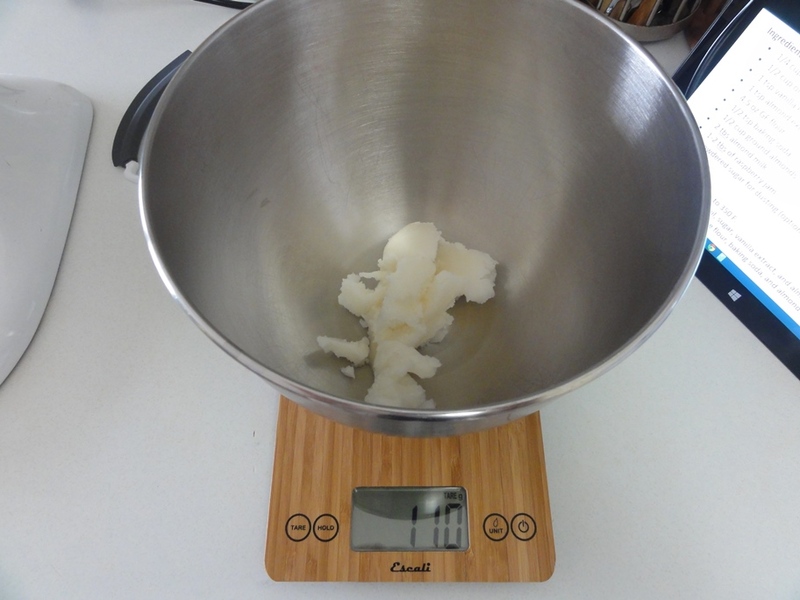 Filling a measuring cup with room-temperature coconut oil can be a frustrating experience because it’s not soft like room-temperature butter and tends to get everywhere. Fortunately the jar I had on hand listed both grams and milliliters on the nutrition label so I was able to figure 1/4 cup as 55g. I suggest checking yours in case the density is slightly different, but 55g should be reasonably close. 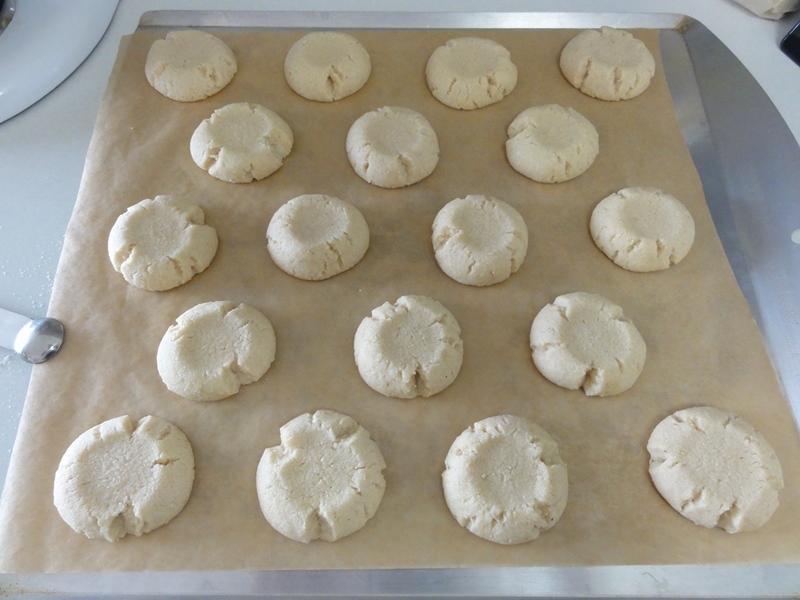 When I made these cookies I doubled the recipe, thus 110g below. 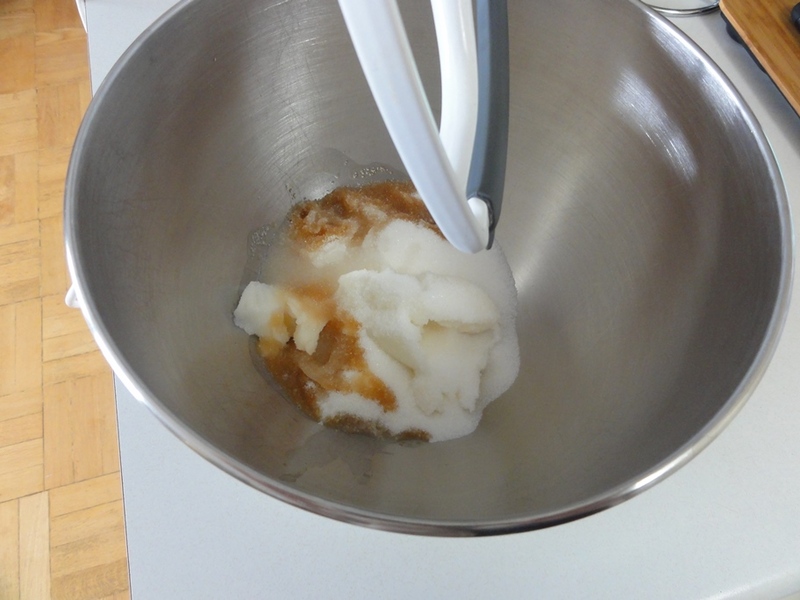 This is not much different to if we’d used butter, however the coconut oil doesn’t cream together quite as smoothly. So long as you have a consistent color and texture you can count it as well combined. Unfortunately I neglected to take a picture of what the dry ingredients look like once well-combined, but considering the color and texture difference between the flour and almond meal you’ll know you’re done once everything’s the same color and texture. I also neglected to take pictures of adding the almond milk. Possibly due to doubling the recipe and thus having 3 cups of dry mixture going into the sugar and coconut oil, my stand mixer was not happy with me when I asked it to mix everything for me. After adding about half of the flour the dough had become quite dry so I added the almond milk then (the original recipe calls for adding it at the end; it also calls for doing this mixing part at first with a fork and then by hand, which I was way too lazy to take on). That loosened things up and my mixer let me add more of the flour. Towards the end though when the dough was too dry again I gave in and switched over to doing it by hand power. 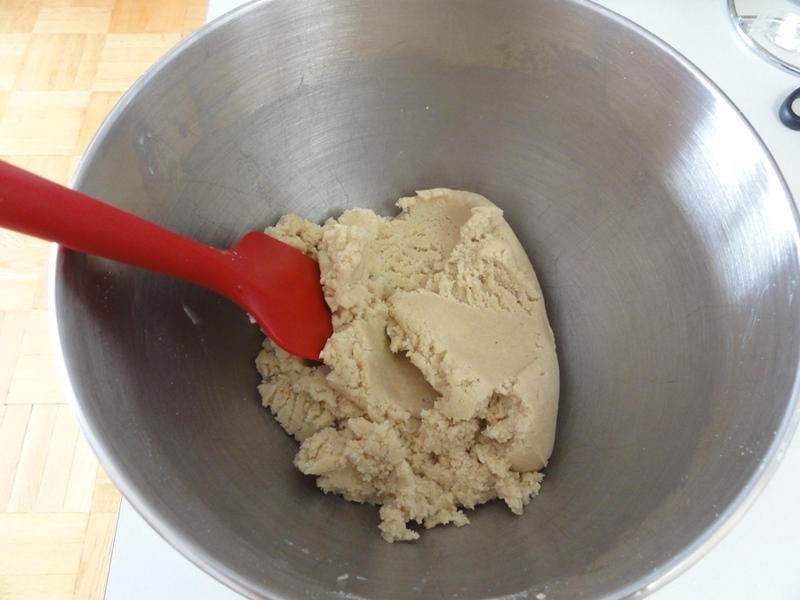 In the end the dough should be consistent and smooth; a little crumbly but easy to work with. From this point on I was diligent about taking photos. 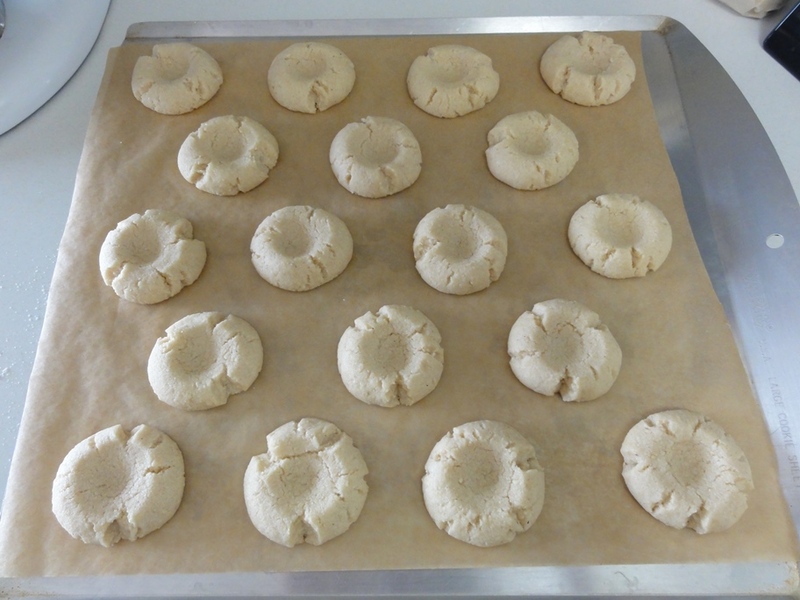 This is also the part where these cookies become a little bit more labor intensive than your average drop cookie. Either use your thumb or the back of a 1/4 tsp measuring spoon to get your initial indentation. After the first 6 minutes in the oven the indentations were all but gone, so I had to indent again. Don’t be like me and forget that the pan is hot! 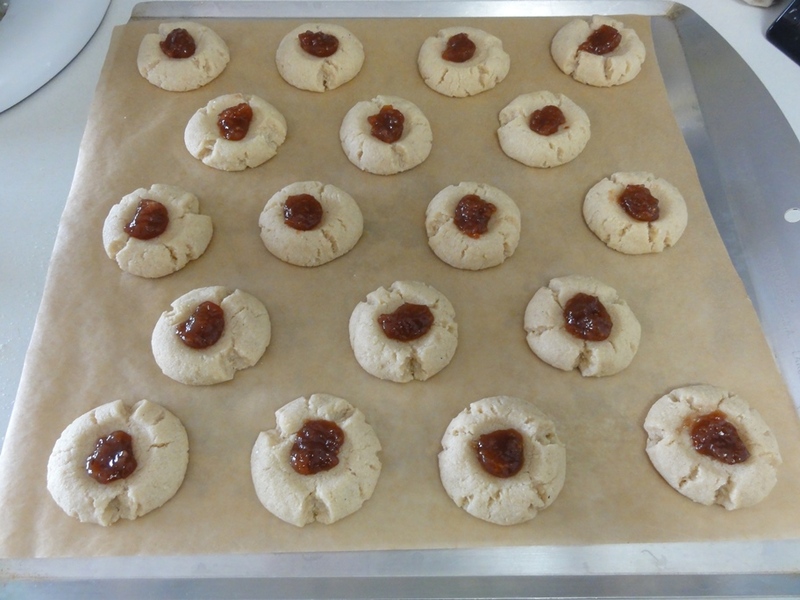 A dollop of raspberry jam for each cookie and then back in the oven for another 6 minutes! Dusting with powdered sugar has got to be one of the most enjoyable experiences in baking. It’s hard to beat snowfall when the snow is made from sugar. It gives these cookies a delightful, winter touch, and considering how it was quite cold outside when I baked these, it was good timing! Mm these look really good 🙂 I like all the photos.